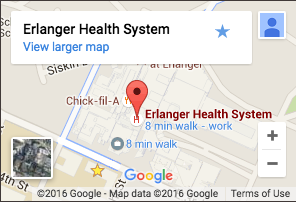 Children’s Hospital at Erlanger offers specialized expertise in the non-surgical treatment of congenital and acquired cardiovascular disorders. The minimally-invasive interventions listed below utilize a catheter —a thin, hollow, flexible tube to study or repair the heart. A trained physician inserts the catheter into an artery of the leg or arm and, using advanced imaging, guides its tip—along with specialized treatment technology—to the heart. Cather-based interventions offer the advantage of faster healing and a shorter hospital stay compared to the alternative of open surgery. Pericardiocentesis, or pericardial tap, to remove fluid from pericardium (sac around the heart) to be tested for infection, inflammation, presence of blood and cancer.